The airport was opened in 1938 as a base for the Royal Air Force but was transferred to civilian use after the war. It was used mainly used for charter flights and executive jets for many years and really started to grow in the 2000s when it was re-marketed as a low-cost airport with "close" proximity to London. Which airlines fly to London Luton Airport? How many runways and passenger terminals does London Luton Airport have? Luton Airport has one runway and one passenger terminal: a two-storey building which has been expanded during the years several time. On the ground floor are the check-in desks and arrivals facilities while the departure lounges are on the upper floor. Where is London Luton Airport located? London Luton Airport is located about 50 km north of London. The Luton Parkway Station is not near the terminal but a 20 minute walk in to town (2 km). There is a regular shuttle bus (1.50 pound) driving between the Terminal and Station. Thameslink trains depart from this station all day and night to central London (London St. Pancras International Train station). Travel time is about 20 minutes and a one-way ticket is 13.50 pounds. There are several buses departing for Victoria tube station which can be cheaper, especially if booked online, but take longer (about 1 to 1.5 hours). A taxi into central London will take about the same time as the bus and is with a fare of at least 90 pounds quite expensive. 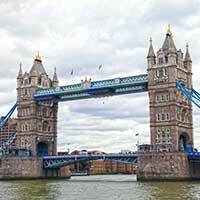 What are popular destinations from London Luton Airport?